Luis and Gordon finally settled down and had a family last week. To our surprise, the root cause of their marriage is just a Skype phone. Although it wasn’t the first time for them to have a wedding, they just can’t help to leave tears of happiness. Two years ago, Luis bought a new released Skype phone in USB Phone World. As her son was studying abroad in US and her husband was dead in an accident, she was used to chat on the Internet and was willing to contact with her son by the Skype phone. In the countryside of Australia, there were only a few neighbors with Luis, which made her feel lonely. However, about a week later, she received a phone call and was told that her Skype phone was sent to him, Gordon, another customer of USB Phone World in US, by mistakes. As was bought in a low price in marketing period, she didn’t keep it in mind but still told him the address of her home. What she didn't realize is that Gordon was just impressed by her sweet voice and enclosed his Skype address with the package. 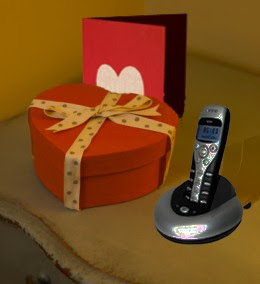 He said that if any problems happened to this Skype phone, she could just contact him while he had taken his efforts to protect it from any damage. Moved by his humorous letter or his kind favor, Luis sent a thanks giving voice mail to Gordon by Skype Phone and a tale of his love started. To hear from each other more clearly and smoothly, they all returned to USB Phone World to download Skypemate. And they are all looking forward the wonderful time of chatting in every single day and rediscover the feeling of first love which is beyond space and time. This year, Gordon decided to move to Australia to enjoy the sweet last years with Luis. After learning about that, the operators of USB Phone World also couldn’t help to be moved to tears.